I want to talk about how you can take your science teaching to the next level, where young people, and especially underrepresented young people (people of color, LGBT, immigrants, girls, etc. ), find what you’re teaching engaging, relevant to their lives, and which research shows that if done thoughtfully, enables them to achieve a higher level of learning. I’m not suggesting you change your science content. Instead, I’d like to illustrate the importance of modifying your teaching to be culturally relevant. Ideally you are already providing hands-on, inquiry-based science experiments, which are known to increase achievement and engagement. [Shameless plug: This is something that a zebrafish program that I work with, BioEYES, does well, so if you need help see our website (www.bioeyes.org), our latest research paper in PLOS Biology that details our results and how to launch an outreach program in your area, read our Node post from 2010, or contact me directly.] How engaged are your students? Are there some that are struggling, or who aren’t that committed? Do your lessons speak to the diversity of individuals that you are teaching? Are they culturally relevant? What does this mean, exactly? Culturally relevant teaching was first described in 1994 by Gloria Ladson-Billings, an education researcher, to mean: “a pedagogy that empowers students intellectually, socially, emotionally, and politically by using cultural referents to impart knowledge, skills, and attitudes.” She suggests reframing how we think about and teach students, especially those typically marginalized by the greater society, from a place of need or as a problem to be fixed, to a place that acknowledges the cultural richness and the assets they bring into the classroom and society. Culturally relevant teaching is based on the following principles: Academic success, cultural competence, and sociopolitical consciousness (Ladson-Billings, 1994). The first principle, academic success, is that we want learners to grow, intellectually. While seemingly obvious, the unconscious biases we educators harbor can sabotage our best intentions. For example, research shows that we call on “poor” performers less often, and spend less time waiting for them to answer. The second principle, cultural competence, is that we introduce students to the global perspectives found in the greater scientific community and the world. Students can then celebrate not only their own cultures, but learn new perspectives as well. And the third and final principal, sociopolitical consciousness, involves helping students to apply their learning to solving some of the world’s pressing problems. How does a scientist apply these principles in a science classroom? Let’s first look more closely at what a culturally relevant classroom is like. You get to know your students on a meaningful level. You identify what each student is interested in, what their values are, what their home life is like, their traditions, style of communicating, and how they relate to their community. You demonstrate caring. By getting to know your students and what they value, you begin to develop meaningful relationships with them and show that you value them, their culture, and their ways of learning, which may be different from traditional ways of learning. This goes beyond merely respecting students and their differences. You build safe spaces for ethnically diverse students to learn and achieve. You provide high expectations for all learners, yet help them succeed in steps, not all at once. You respond to ethnic diversity while delivering instruction. You actively seek out ways to incorporate your students’ lives and cultures into the science lessons you’re providing. Now why is this all so important? For one, research shows that academic scores increase when you deliver culturally relevant instruction (Au & Kawakami, 1994; Boykin & Noguera, 2011; Foster, 1995; Gay, 2000, 2010; Hollins, 1996; Ladson-Billings, 1994, 1995; Paris, 2012; Scherff & Spector, 2011). Boutte, Kelly-Jackson, & Johnson (2010) emphasize that: “academic achievement is a central goal of culturally relevant teaching.” When you set high expectations for students, which for starters can be as simple as calling them “scientists” no matter their age, it shows that you believe they can achieve great things. They feel valued. Secondly, many minority students have spent their entire lives having to fit into a dominant culture, while their own culture has been suppressed, oppressed, and devalued. This has a profound affect on an individual’s identity. It forces one to try and maintain one identity at home and in their community, and a separate identity at school. Imagine what that feels like. Teaching from a culturally relevant framework supports and nurtures student identities and values. It creates a safe space that allows students to excel, and sometimes to fail. But when failing in a supportive environment, you can help them get back up and try again, step by step. It is this scaffolding of learning that helps struggling performers engage with learning and to advance. So how do you apply culturally relevant teaching to science? For starters, be willing to look at your own beliefs and biases toward others. Take a few implicit bias tests (https://implicit.harvard.edu/implicit/takeatest.html). Understand that we all have unconscious biases. While difficult, seek out ways to challenge your assumptions (https://www.psychologytoday.com/blog/sound-science-sound-policy/201501/overcoming-implicit-bias-and-racial-anxiety). Learn about and interact with other cultures. Put yourself in others’ shoes. Be the curious scientist you know yourself to be. In the process, you might even find ways to mitigate the global stereotype that all scientists are White males that wear glasses and like to blow things up in the laboratory (Finson, 2002). Next, get to know the population you serve even more. You could start by administering a student inventory (http://www.cultofpedagogy.com/products-for-your-classroom/). Or have the classroom teacher administer a survey. What you learn can help you to build an authentic relationship and can generate ideas for ways to incorporate a student’s culture into your lessons. Don’t make assumptions about who they are. Find out who they are. Deal directly with controversial subjects such as racism, sexism, homophobia, and poverty. Give them context. You might think about how science has historically been done by and for men, and how this has shaped the field (e.g., medical dosages are prescribed similarly for men and women, yet women sometimes need a lower dose). How might a discussion about this change the way we do/view science? What can you and your students do about it? While genetics education might start with Gregor Mendel, communities like the Native Americans have been doing experiments on corn for thousands of years but didn’t write down their findings because they followed an oral tradition. How might a Native student who brings this prior knowledge into the classroom then respond to a teacher who posits Mendel as the founder of genetics? Study a wide range of individuals and ethnic groups. Include many perspectives. No one person represents a group. Again, this is true for you as well as each student in your class. What interests you? Where is there commonality with your students? How might you infuse issues of social justice, for example, into a science activity? One example involves teaching students science vocabulary (http://www.cultofpedagogy.com/culturally-responsive-teaching-strategies/). Author Zanetta Hammond suggests making a game of it, making the activity a social one, or “storifying” it. All three strategies employ the techniques of oral traditions—listening, repetition, memorization and learning—which are common to many cultures. In addition, marginalized populations often share a history of having to pool their resources in order to survive or get ahead, and value their community and group over individual gain. Creating groups where students can socialize and work together is not only inclusive of all cultures, but models the collaborative nature of scientific work. Help students make connections between the science content, the contributions made by underrepresented scientists, and your students’ lives. This does not mean you change the science content. But you can incorporate data, photos, examples, and information from different cultures into each lesson so multicultural science education is institutionalized in your program and practices, as opposed to being taught in isolation (e.g., during Women’s History Month only). If you are working with African-American learners, you could talk about and show photos of prominent African-American scientists (e.g., biologists Ernest Just and Charles Drew), show data and graphs of diseases that disproportionately affect African Americans, or provide examples of scientific research that has been done to African Americans (e.g., Tuskegee experiment). By utilizing the techniques of science—such as the scientific method, arguing from evidence, and problem solving—you can elucidate and challenge stereotypes and prejudices. You might frame a genetics unit not around Gregor Mendel, but around researchers of color: Priya Moorjani, a geneticist who has used genomic data to understand the origins of the Indian caste system; Kono Yasui, a biologist who researched the genetics of several plant species; or Rick Kittles who used genetics to trace the ancestry of African Americans. Or you might choose a woman like Barbara McClintock who was not encouraged personally or professionally to study science, but who still went on to win the Nobel Prize for her work in genetics. 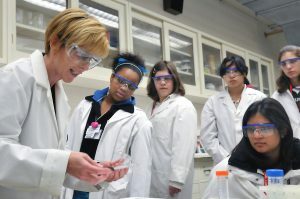 Here we have several examples that are inclusive of women’s contributions to science (also see http://news.nationalgeographic.com/news/2013/13/130519-women-scientists-overlooked-dna-history-science/). Pay attention to areas of intersectionality. Are there LGBT researchers you know of? Look for these role models, many of which may be “hidden” or ignored, and celebrate them. The key is that you are not teaching specifically to a particular ethnicity or group, but are incorporating different perspectives and creating an inclusive, relevant, and supportive environment for learners from various backgrounds. While some of these ideas may give you pause —perhaps you feel they require too much effort or take you too far outside your comfort zone—you don’t have to include everything, or even everything all at once (1). Start with small changes, and identify where you and your students share common ground and what you are comfortable with. Feel free to share activities and examples you find in the comments below. Challenge yourself over time to go beyond a casual interpretation of culture in your science classes and in your lab but instead think about how your lessons might allow for opportunities for critical debates on the role and practices of science in society (Ladson-Billings, 2014). I argue that by not expanding upon our current view of science knowledge and oppression’s role in shaping it, we reinforce and privilege Eurocentric hegemonic ideas. By teaching to the whole child, you will gift your students with strong identities, new perspectives, and ultimately will engage them more in science, increase their critical thinking skills, spur greater learning gains, and hopefully help them consider a career in the sciences. And who doesn’t want that? Au K.H., & Kawakami, A.J. (1994). Cultural congruence in instruction. In E.R. Hollins, J.E. King, & W.C. Hayman (Eds. ), Teaching diverse populations: Formulating a knowledge base (pp. 5–23). Albany: State University of New York Press. Boutte, G., Kelly-Jackson, C., & Johnson, G.L. (2010). Culturally relevant teaching in science classrooms: Addressing academic achievement, cultural competence, and critical consciousness. International Journal of Multicultural Education, 12(2). Foster, M. (1995). African American teachers and culturally relevant pedagogy. In J.A. Banks & C.A.M. Banks (eds. ), Handbook of research on multicultural education (pp. 570–581). New York: Macmillan. Gay, G. (2010). Culturally responsive teaching, 2nd Ed. New York, New York: Teachers College Press. Hollins, E.R. (1996). Culture in school learning: Revealing the deep meaning. Mahwah, NJ: Lawrence Erlbaum. Ladson-Billings, G. (1994). The Dreamkeepers: Successful teaching for African-American students. San Francisco: Jossey-Bass, pp. 17–18. Ladson-Billings, G. (1995). Toward a theory of culturally relevant pedagogy. American Educational Research Journal, 32(3), 465–491. Ladson-Billings, G. (2014). Culturally relevant pedagogy 2.0: aka the remix. Harvard Educational Review, 84(1), 74-84. Scherff, L., & Spector, K. (2011). Culturally relevant pedagogy: Clashes and confrontations. Lanham: Rowman & Littlefield Education. What a great post! Social justice and equity in science is achievable and the suggestions given in the article provide many options for teachers and administrators to consider and implement. Thank you for addressing these important issues! Hi Renee, Thank you for your comment. My hope is to inspire others to consider these issues. They are important if we are serious about changing the status quo and creating equity in the sciences. I am soon to be teaching a course for elementary educators titled “Using Phenomena & Discourse to Develop Meaningful, Equiptale Science Instruction. Your blog helps push my thinking . Hi Kathy, Thanks for your comment. I’m glad you found the blog post helpful. You could try to incorporate some of these principles into your teacher workshop as a way to model cultural relevance for them. For example, you might deliver a survey so that you get to know more about the teachers, then try to incorporate some of what you learn from the survey into your teacher workshop. Or have everyone take a implicit bias test and talk about the results. If you find something that works, please let me know. Good luck with your course!